In honor of the gardening unit Miss Priss and her class are completing right now, we will be sending Dirt and Worms for kindergarten snack tomorrow. Miss Priss thought it might not be a “healthy” snack, and she is probably right. I did a little rationalizing much like Bill Cosby’s reasons for serving chocolate cake for breakfast, and I think the milk in the pudding bumps the snack into the safe zone. Cream the butter, cream cheese, and powdered sugar together in one bowl. Mix pudding together with the milk in another bowl until stiff. Add the Cool Whip to the pudding mixture. Mix the cream cheese mixture into the pudding mixture until smooth (I use a whisk). Crush the Oreos in a food processor. Start with 1 1/2 packages, then crush the rest if you need more crumbs. 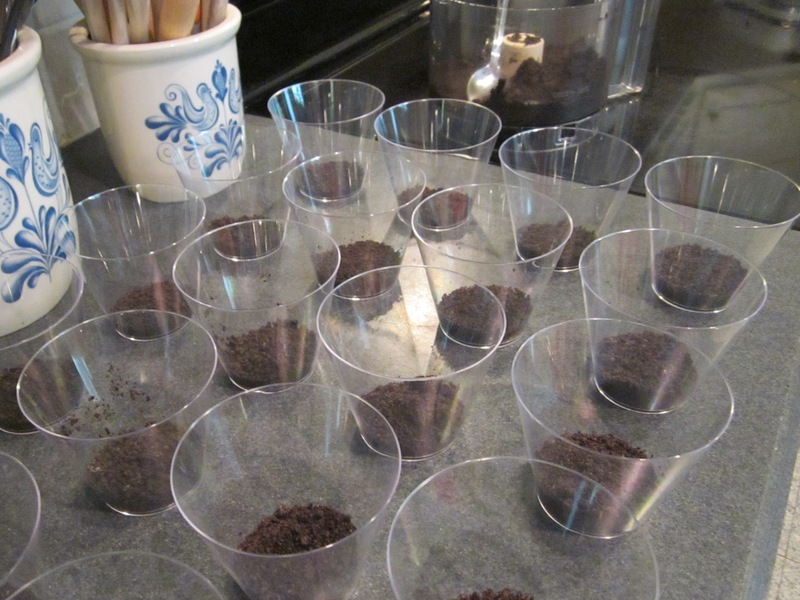 For individual snacks, Layer 1 heaping tablespoon of Oreo crumbs, then ~1/2 cup pudding mixture, then another tablespoon of crumbs in 9 oz. clear plastic tumblers. Top with 1-2 Gummi worms. You will get ~20 individual cups. Can be made the night before and refrigerated until time to serve. Replace the vanilla instant pudding with chocolate. I think the chocolate pudding makes the snack too chocolate-y, which is why I use the vanilla. The chocolate pudding color is obviously more authentic as real dirt. 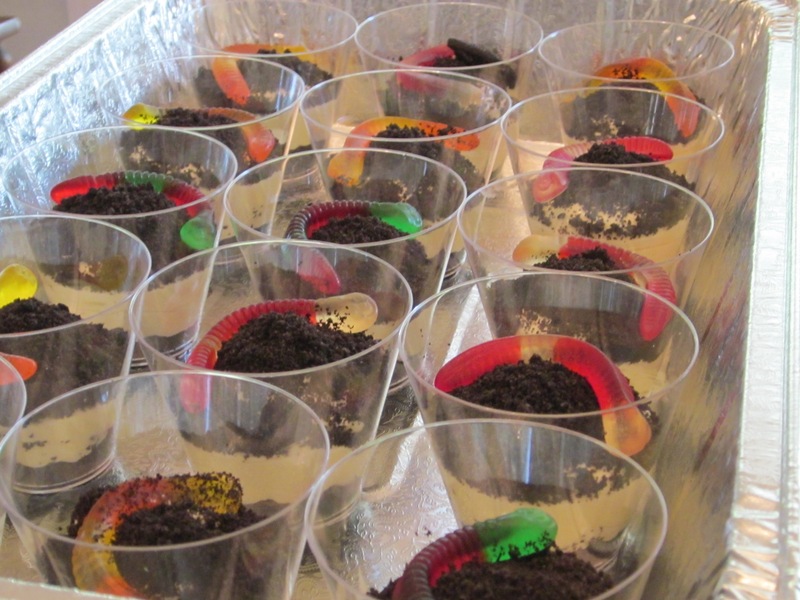 Use graham cracker crumbs instead of Oreos, and mini Swedish fish instead of Gummi worms, and top with a small drink umbrella to make “the beach”. 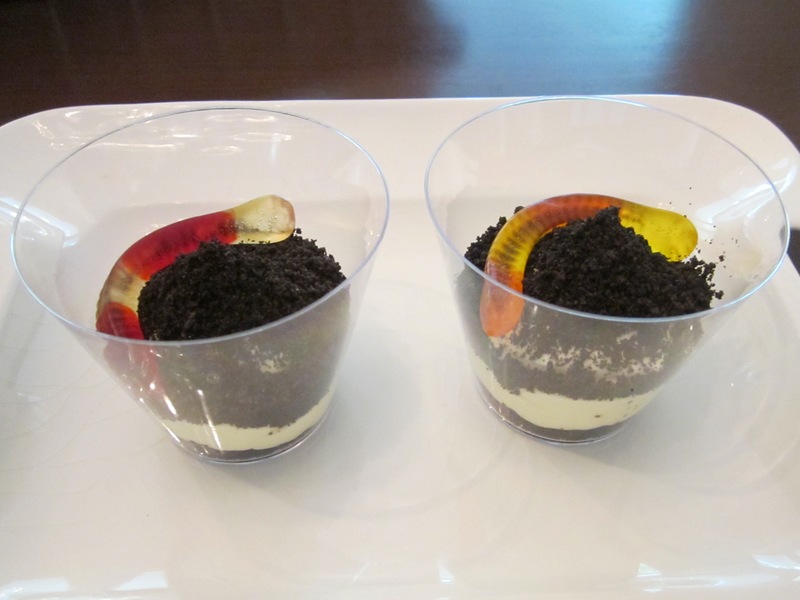 Line a flower pot with tin foil and layer crushed Oreos and pudding in the pot. Top with Gummi worms and a plastic flower(s). There is a chance we will have one more kindergarten snack opportunity this year. Any thoughts? 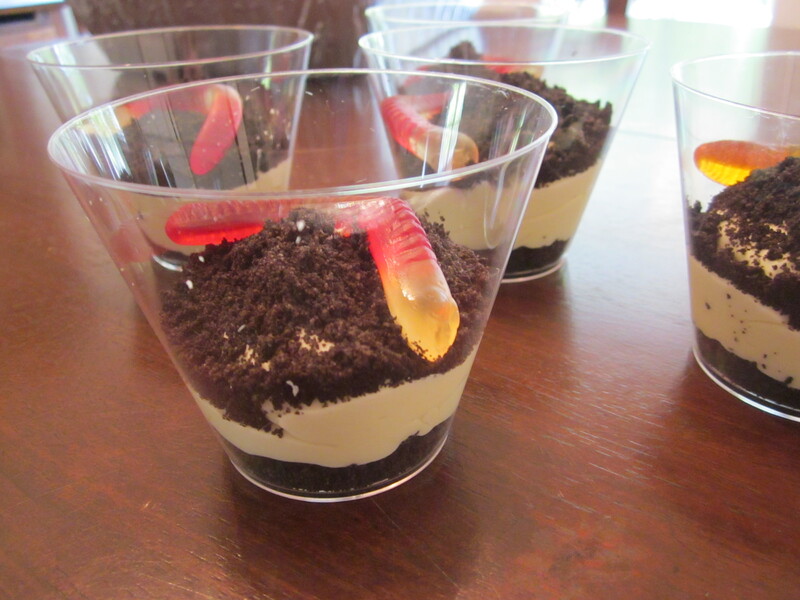 I don’t think I can top the Dirt and Worms. After reading your recipe, I think I might delete the butter– or at least reduce it!